WHEN: April 1 to April 28. The opening reception will take place on Saturday, April 13 from 3 to 6 p.m. Musical guest is The Juan Ruiz Trio. Gallery hours are 90 minutes prior to the Luna Stage Performances on Saturdays from 6:30 to 8 p.m. and Sundays from 2 to 4 p.m.
INTROSPECTION incorporates new pieces working with embossing, resin and alcohol inks in addition to D'Rivera's traditional pen and ink creations. The designs and paintings incorporate buttons, beads, feathers and rope in inimitable collages, reflecting the sensuality of the Caribbean female. Pieces come to life under the spell of music, creating an intimate dialogue in a silent, but very powerful way. “Laugh, enjoy the colors of life, find your purpose. That’s what my art stands for—JOY," D'Rivera said. “Movement, love, life and anything that makes you smile or even better... laugh out loud." 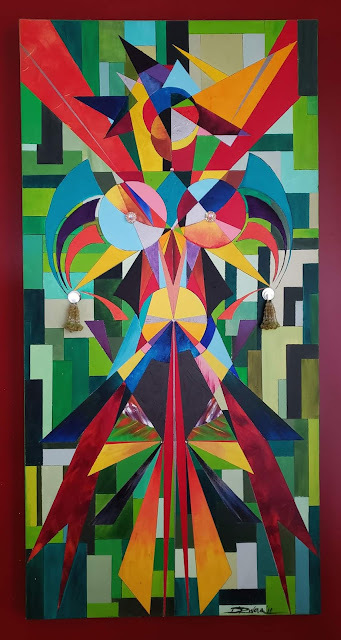 D'Rivera has previously exhibited in New York City; Homestead and Miami, Florida; Oakland, California; and various galleries throughout New Jersey. Born in Cuba and raised in New York and New Jersey, D’Rivera comes from a creative and musically-talented family. Her brother, Paquito D’Rivera, is a virtuous clarinetist and composer and a 14-time Grammy Award winner. D'Rivera gives all honor and credit to her mother, Maura, for inspiring her with the love of the arts. When she died in 2012, D'Rivera's creative flow died too. Nothing flourished, pens dried up, inks became unusable and canvases became dusty. 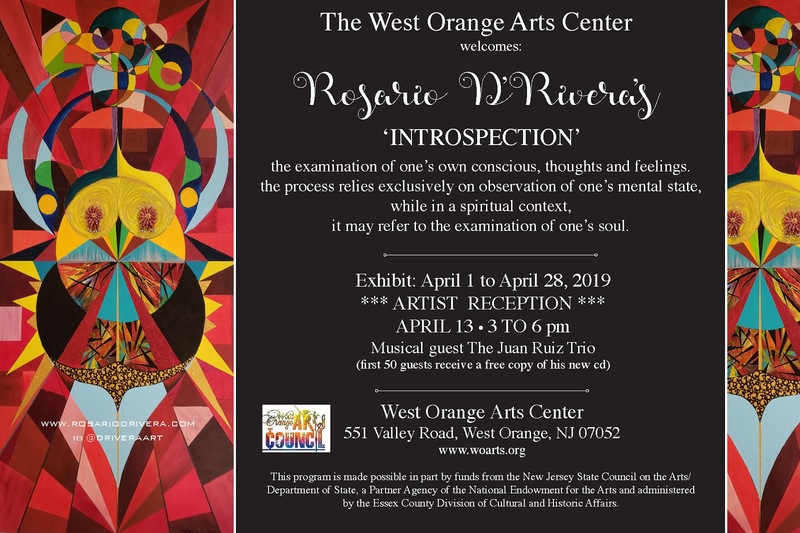 At the recent Alberto Hernandez show at the West Orange Arts Center, D'Rivera was stirred by his colors and her muse returned in full force. After six years of inner reflection, soul searching and contemplation, she dedicates this exhibit to honor her mother Maura. For more information about the artist, visit her website, www.rosariodrivera.com. Follow her on Instagram @driveraart. The West Orange Arts Council was established in 1998 to cultivate, inspire and support the arts in West Orange. Area artists and community leaders remain the core of this all-volunteer organization that operates the West Orange Arts Center gallery and gift shop at 551 Valley Road, West Orange, NJ. "Welcome to the West Orange Arts Center!" is this year’s exciting year-long celebration of the arts, representing various artists, workshops, exhibits, and activities to enhance the lives of the residents of West Orange and neighboring communities.